Sadly, I am writing to tell you that we helped Max cross over the rainbow bridge. We knew today was coming. We prepared for it the best we could, but it didn’t stop the tears from flowing when it was time to say good-bye to our beloved Bengal Max. Max was diagnosed with squamous cell carcinoma of the jaw bone (cancer) about six weeks ago. It was very difficult knowing his time was limited, but also a blessing because it gave us the opportunity to make every day special. His last weeks were filled spending time in his bungalow with friends Bullet and Jewel. The weather was great, so he had dozens of sunny days to nap outside. As we saw him declining, we knew we would make the decision to ensure he never had a bad day. The night before he passed on, we gave him a rug filled with piles of catnip. He rolled, rolled and rolled even more. He was covered from head to toe with the catnip he loved and had a wonderful time. He spent his last day surrounded by animals and caretakers that loved him. He napped in the sun most of the day, happily lapping up two cans of tuna. It was the best way we could say good-bye, but it still wasn’t easy. Max had such a sweet demeanor and let Bullet be the bossy cat in the bungalow. He loved to be pet and doted upon, but not to be picked up. He was such a happy and calm boy and was able to leave that way, too. He will be forever loved and forever missed. Losing a resident is the most difficult part of what we do. It’s something that never gets easier, no matter how many times we go through it – even knowing we gave them the best years possible. I know you understand what we go through. You’re there with us. Each of you care about the animals as much as we do. And so many of you have your own 4-legged family members that you’ve had to say goodbye to. I feel honored that you share so many of your stories with me – both of their life and when you’ve had to say goodbye. Each passing at The Wildcat Sanctuary is different, but each takes a piece of our heart with them. Sometimes we’re grieving because we didn’t get a proper goodbye. Others are because we fought so hard to treat their illness and still lost. Now we’re grieving, because we know the time is near for one of our residents and we’re cherishing each day with him. 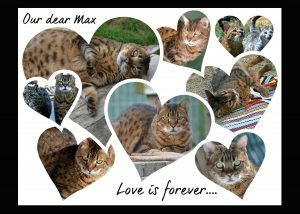 Max 2, one of our small Bengal cats with a huge loving heart, has cancer. He’s been diagnosed with squamous cell carcinoma of the jaw bone (cancer), a disease we lost his sister to several years ago. Max loves cats and humans. His only vice that led him to a Sanctuary was not properly using the litter box. He and his friend Bullet are always at the door greeting caretakers. Max is very gentle and friendly and his meow mirrors his personality. Being able to see him each day is such a blessing. And each day we hope that he’ll be there to greet us at the door and be ready to eat all of his food and medication. Because when that changes, we know the cancer has won and it will be our difficult decision to say goodbye while he has dignity and a quality of life. It’s days like this that you realize how much you depend on the little faces greeting us at each bungalow door. Just how much each one means to us. And how hard letting go is. Thank you for allowing us to be there for Max and give him such specialized veterinary care. And more importantly, thank you for giving us the privilege to care for Max and all the other cats that call The Wildcat Sanctuary their home. 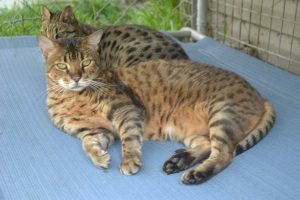 Max and Issy were a pair of Bengal cat siblings that were surrendered to a rescue group in Illinois. Though they were very outgoing with terrific personalities, they were inconsistent in using the litter box and therefore given up to the rescue group. They were deemed unsuitable for adoption because of this and came to live with us here at The Wildcat Sanctuary. Max was born in 2002 and came to his forever home here at the sanctuary in 2008. We were glad we were able to accept both Max and his sister Issy into our Bengal program at that time. They both greeted the caretakers each time their habitat was entered and they would sit next to anyone, just waiting for attention. Max was always a little more vocal than Issy and would talk to the caretakers whenever they were cleaning his habitat. Sadly, and unexpectedly, Issy passed away in 2012 from soft tissue cancer. Thankfully, Max has the comfort of living happily with other Bengal cats – Mark, Bullet, and Jewel. They all live together in a bungalow with indoor and outdoor areas, complete with perches, hammocks, an in-ground pool, and plenty of room to play. They also have an indoor area where they can escape from the harsh Minnesota winters and warm summer days.